سنة 1881 (MDCCCLXXXI) كانت سنة بسيطة تبدأ يوم السبت (الرابط يعرض التقويم كاملاً) التقويم الگريگوري، السنة 1881st بعد الميلاد (م)، السنة 881st في الألفية 2، السنة 81st في القرن 19، والسنة 2nd في عقد 1880 بين 1583 و 1929 ومع فارق 1881 is 12 يوم عن التقويم اليوليوسي، والذين ظلوا مستخدمين حتى التحول الكامل إلى التقويم الگريگوري في 1929. January 1–24 – Siege of Geok Tepe: Russian troops under General Mikhail Skobelev defeat the Turkomans. January 13 – War of the Pacific – Battle of San Juan and Chorrillos: The Chilean army defeats Peruivan forces. January 15 – War of the Pacific – Battle of Miraflores: The Chileans take Lima, capital of Peru, after defeating its second line of defense in Miraflores. January 24 – William Edward Forster, chief secretary for Ireland, introduces his Coercion Bill, which temporarily suspends habeas corpus so that those people suspected of committing an offence can be detained without trial; it goes through a long debate before it is accepted February 2. January 25 – Thomas Edison and Alexander Graham Bell form the Oriental Telephone Company. February 4 – Linnington Manor burns to the ground; only William Linnington remains unharmed. February 13 – The first issue of the feminist newspaper La Citoyenne is published by Hubertine Auclert. February 16 – The Canadian Pacific Railway is incorporated. February 18 – Carlos Finlay introduces his discovery of the transmission of Yellow Fever by mosquitoes Aedes aegypti, in the Fifth International Sanitary Conference held in Washington D.C..
February 19 – Kansas becomes the first U.S. state to prohibit all alcoholic beverages. February 25 – Phoenix, Arizona is incorporated. March 1 – The Cunard Line's إس‌إس Servia, the first steel transatlantic liner, is launched at Clydebank in Scotland. March 4 – James A. Garfield is sworn in, as the 20th President of the United States. March 12 – Andrew Watson makes his Scotland debut, as the world's first black international football player. March 13 – Alexander II of Russia is killed near his palace, when a bomb is thrown at him, an act falsely blamed upon Russian Jews. He is succeeded by his son, Alexander III. March 23 – The First Boer War comes to an end. April 11 – Spelman College is established in Atlanta, Georgia. April 14 – The Four Dead in Five Seconds Gunfight erupts in El Paso, Texas. April 15 – Temuco, Chile is founded. April 15 – Anti-Semitic pogroms in Southern Russia begin. April 21 – The University of Connecticut is founded as the Storrs Agricultural School. April 25 – Caulfield Grammar School is founded in Melbourne, Australia. April 28 – Billy the Kid escapes from his 2 jailers at the Lincoln County Jail in Mesilla, New Mexico, killing James Bell and Robert Ollinger, before stealing a horse and riding out of town. May 10 – Romania is proclaimed a kingdom; Prince Karl of Hohenzollern-Sigmaringen is crowned King of Romania. May 12 – In North Africa, Tunisia becomes a French protectorate by the Treaty of Bardo. May 13 – The Pacific island of Rotuma cedes to Great Britain, becoming a dependency of the Colony of Fiji. 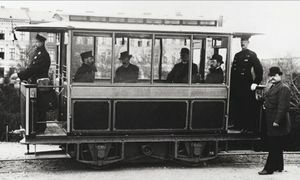 May 16 – The world's first regular electric tram service is started in Berlin, by Siemens & Halske. The American Red Cross is established by Clara Barton. The United States Tennis Association is established by a small group of tennis club members; the first U.S. Tennis Championships are played this year. June 12 – The USS Jeannette is crushed in an Arctic Ocean ice pack. June 18 – The League of the Three Emperors is resurrected. June 20 – The current Cincinnati Reds baseball team plays its first game. June 26 – War of the Pacific – Battle of Sangrar: Peruvian and Chilean forces battle to a draw. July 1 – General Order 70, the culmination of the Cardwell–Childers reforms of the British Army's organization, comes into effect. July 2 – Assassination of James A. Garfield: United States President James A. Garfield is shot by lawyer Charles J. Guiteau in Washington, D.C. The wound becomes infected, killing Garfield on September 19. July 4 – Tuskegee Institute opens in Alabama. July 7 – The first episode of Carlo Collodi's The Adventures of Pinocchio is published in Italy. July 14 – Billy the Kid is shot and killed by Pat Garrett, outside Fort Sumner, New Mexico. July 20 – American Indian Wars: Sioux chief Sitting Bull leads the last of his fugitive people in surrender to United States troops at Fort Buford in Montana. July 23 – The Boundary Treaty of 1881 between Chile and Argentina is signed in Buenos Aires. August 3 – The Pretoria Convention peace treaty is signed, officially ending the war between the Boers and Britain. August 27 – The fifth hurricane of the Atlantic season hits Florida and the Carolinas, killing about 700. September 5 – The Thumb Fire in the U.S. state of Michigan destroys over a million acres (4,000 km²) and kills 282 people. September 12 – Francis Howell High School (Howell Institute) in St. Charles, Missouri, and Stephen F. Austin High School in Austin, Texas open on the same day, putting them in a tie for the title of the oldest public high school west of the Mississippi River. September 19 – President James A. Garfield dies eleven weeks after being shot. Vice President Chester A. Arthur becomes the 21st President of the United States. September 20 – President Chester A. Arthur is sworn in. September 26 – Godalming in England becomes the first town to have its streets illuminated by electric light (hydroelectrically generated). October 5–December 31 – The International Cotton Exposition is held in Atlanta, Georgia. October 10 – Richard D'Oyly Carte's Savoy Theatre opens in London, the world's first public building to be fully lit by electricity, using Joseph Swan's incandescent light bulbs. The stage is first lit electrically on December 28. October 13 – Determined to bring about the revival of the Hebrew language as a way of unifying Jews, Eliezer Ben-Yehuda has what is believed to be the first conversation in Modern Hebrew, with friends living in Paris. October 26 – The Gunfight at the O.K. Corral occurs in Tombstone, Cochise County, Arizona, USA. October 29 – Judge (U.S. magazine) is first published. November – The Newcastle United F.C. is founded as the Stanley F.C., with a further name change to Newcastle East End F.C. the following year. November 3 – The Mapuche uprising of 1881 begins, with an attack on Quillem, Chile. November 9 – Brahms' Piano Concerto No. 2 premieres in Budapest. November 11 – The Clarkson Memorial in Wisbech is completed, and unveiled to the public. November 19 – A meteorite strikes the Earth near the village of Großliebenthal, a few kilometers southwest of Odessa, Ukraine. December 8 – Ringtheaterbrand: At least 380 die in a fire at the Vienna Ringtheater. December 25–27 – The Warsaw pogrom is carried out in Vistula Land, Russian Empire. December 28 – Virgil Earp is ambushed in Tombstone, Arizona, and loses the use of his left arm. Kinshasa (the capital of the modern-day Democratic Republic of the Congo) is founded by Henry Morton Stanley, as a trading outpost called Léopoldville. On the Isle of Man (an internally self-governing dependent territory of the United Kingdom), the House of Keys Election Act extends the franchise for the national legislature, to spinsters and widows owning real estate of a certain value. Edward Rudolf founds the Church of England Central Society for Providing Homes for Waifs and Strays (modern-day The Children's Society). The Pali Text Society is founded by British scholar Thomas William Rhys Davids, for the study of Pali (Ceylonese) texts. Some Vatican archives are opened to scholars for the first time. Minto, North Dakota, is founded. New York City's oldest independent school for girls, the Convent of the Sacred Heart New York (91st Street), is founded. Culford School, a public school in Suffolk, England, is founded as the East Anglian School for Boys. Leyton Orient F.C. is founded in London. 12 مارس - مصطفى كمال أتاتورك مسقط الخلافة ومؤسس أول دولة تركية حديثة. ^ "An Act Respecting the Canadian Pacific Railway"
^ أ ب Williams, Hywel (2005). Cassell's Chronology of World History. London: Weidenfeld & Nicolson. pp. 434–435. ISBN 0-304-35730-8. ^ "Godalming Power Station". Engineering Timelines. Archived from the original on July 16, 2011. Retrieved 2010-07-06. ^ "The Savoy Theatre". The Times. London. 1881-10-03. p. 7. ^ Burgess, Michael (January 1975). "Richard D'Oyly Carte". The Savoyard: 7–11. ^ "Savoy Theatre". The Times. 1881-12-29. p. 4. Retrieved 2012-01-30. ^ Kelemen, Lawrence. "The History of Christmas". simpletoremember.com. SimpleToRemember.com - Judaism Online. Retrieved 8 February 2016. ^ "BBC - History - Alexander Fleming". bbc.co.uk. Retrieved 3 January 2017.